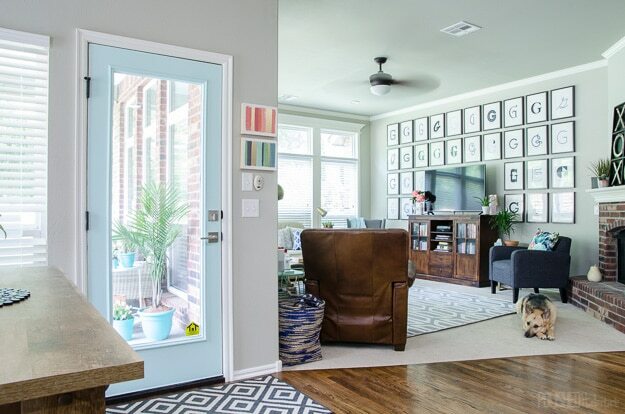 We’ve all seen amazing examples of the power of paint when it comes to transforming a room. However, I always feel like I have to block out most of a day, if not more, to make that transformation happen. This week, I spent about an hour on a much smaller painting project and still ended up with a dramatic effect. 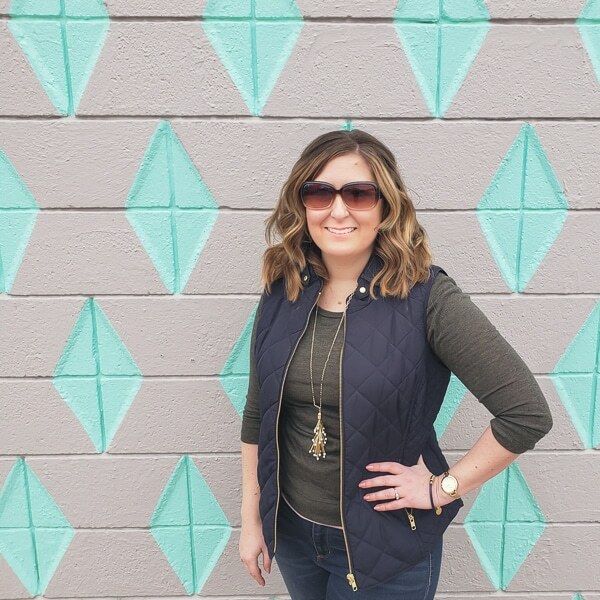 When I painted the outside of our back door, I liked it so much that I started wondering if we could pull off the same light teal color INSIDE the house. The door was white, which certainly looked “fine”, but could it be better? The more I thought about it, the more I loved the idea of drawing attention to the back door and eyes to the pretty new set up outside. Plus, I thought it would provide the perfect transition between the two spaces. 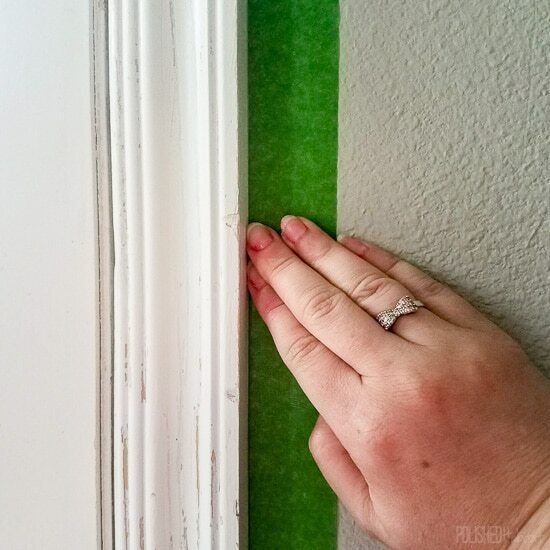 The timing couldn’t have been better because the white paint along the door frame and base molding next to the door had taken some serious Maddie abuse over the years. It was past time for a touch-up. 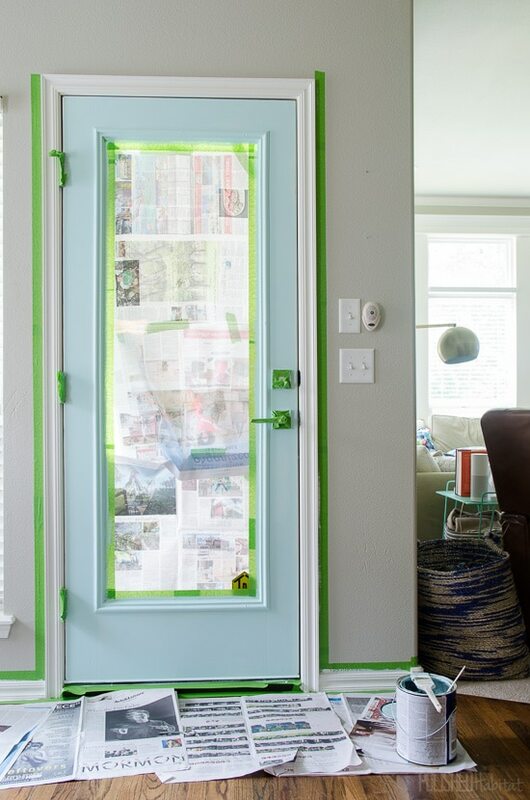 To get started, all I needed was my paintbrush, leftover paint, and my trusty FrogTape. 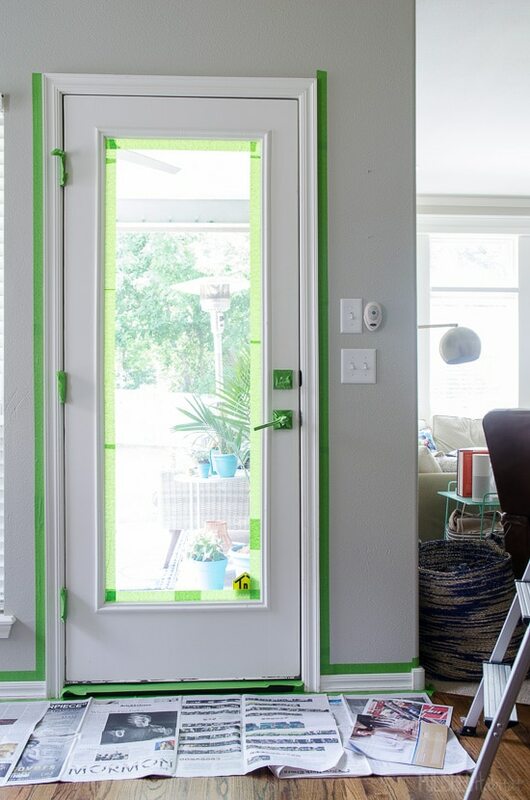 You’ve probably noticed green tape in photos any time we’ve painted before, so I was excited when they asked if I’d like to do a project with them! Sometimes I go through phases and think I’m good enough with the brush that I don’t need to tape first. It’s ALWAYS a mistake. I can tell you the door paint job looks way better inside than the freehand job I did on the outside. After noticing I wasn’t as good as I thought with the paint brush outside, I happily taped up the wall next to the molding, the door glass, and all the door hardware. It didn’t take long and was SO worth it. I make sure to press down on the tape really well to create a nice seal as I apply each piece. 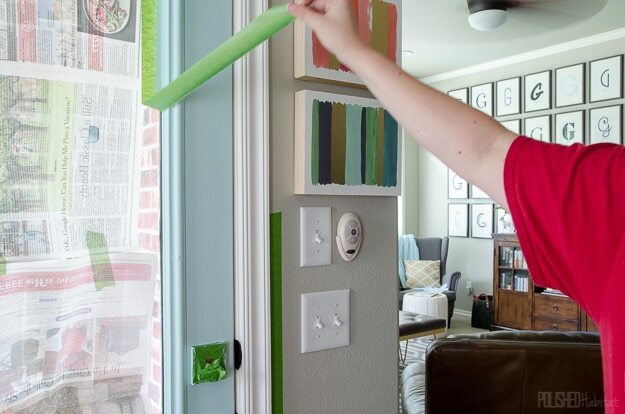 With FrogTape, painting is more like filling in the bold lines of a toddler’s coloring book. So much less stressful than trying to paint a straight line! Before I knew it, the door was painted and the molding was all white again. As soon as I finished painting, it was time to pull off the tape. Ah, a nice crisp line! If you zoom in on the photo above, you can tell that the inside is crisp, while the outside that I did WITHOUT FrogTape is NOT so perfect. 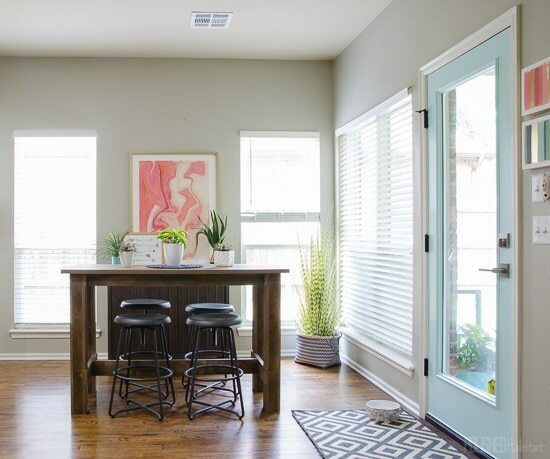 I can’t get over home much this little splash of paint makes the room feel more airy and fun! It also ‘morphed’ the inside with outside perfectly. The kitchen nook has always been an afterthought when it comes to decor because we’ve been working on higher priority rooms. 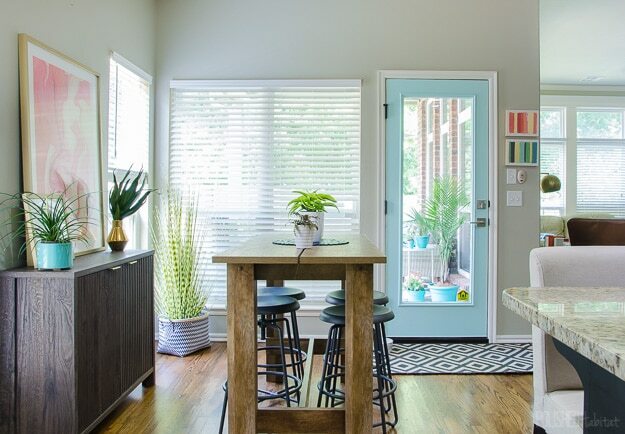 The two wood pieces together on the wood floor don’t feel like “me”, but taking the hour to paint the door made a HUGE difference in how I feel about the space. From the time we built our home, the goal has always been to NOT have it seem like we live in typical suburban, new construction home. 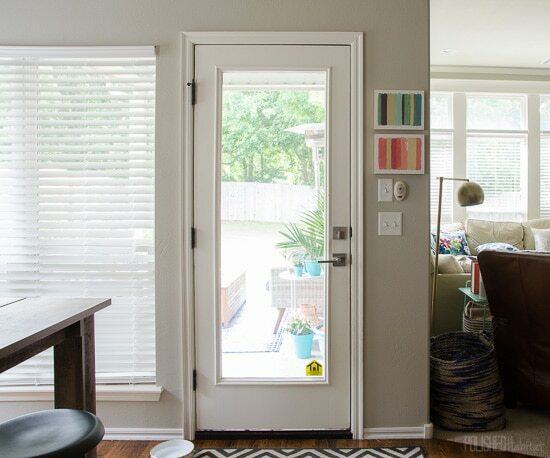 Project by little project, we’re getting closer to that goal of totally customizing our home! Unless you’re Rembrandt, always use FrogTape when you are painting. 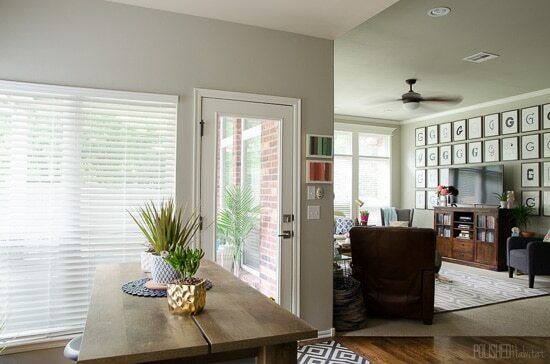 To create cohesion, look for small ways to morph rooms together, like adding a pop of color from one room to an adjoining space. 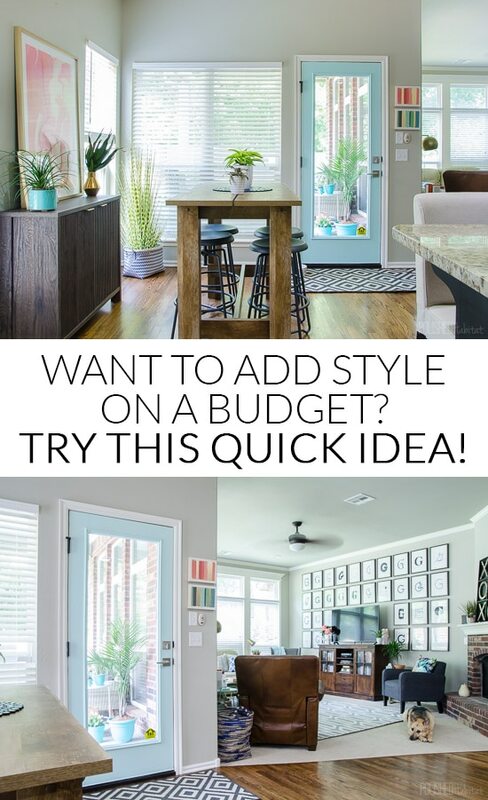 Don’t wait for the time-intense or big-budget projects to make your home feel more like you. Small projects can make a big difference. I didn’t have to spend ANY money to paint the door. We had everything from prior projects! Creating your dream home is a LONG process, but that’s okay! You’ll end up with a much more satisfying, collected home of memories instead of looking like you live in a furniture store. 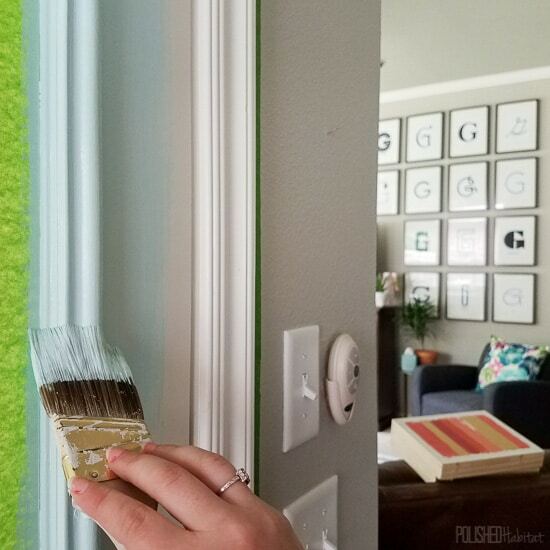 For more inspiration, you can check out the rest of the 2017 FrogTape® Design Trends! You can learn more about FrogTape by following them on social media. I alway see fun project ideas on their Instagram account. Here are the links so you don’t have to hunt them down! One last look at the before & after! And feel free to pin the image below if you want to remember this idea for later! Thank you Lori! I get excited all over again every time I walk through and see it! Yes, very pleasing! I don’t really know why I get nervous about painting (maybe the idea that if its not perfect, it will just look worse than when I started! ), but I resolve to get better! I absolutely worry about that too, Sally! Then I go through phases of being willing to paint anything and everything, because we can always repaint if something goes horribly wrong! 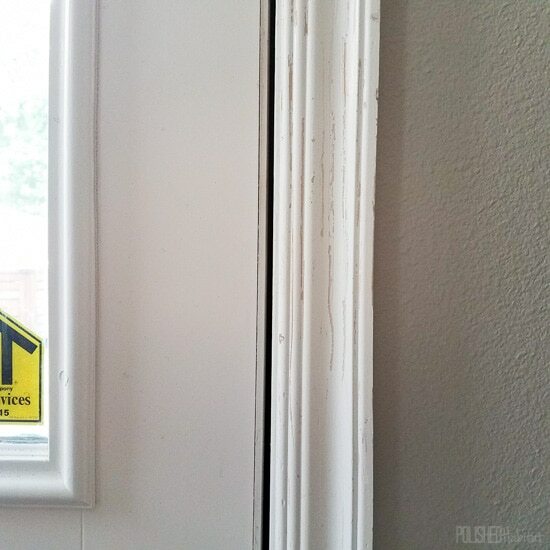 Plus, every time I go tour a new model home, I notice little imperfections in their paint or other finishes as well. Turns out even the pros are not perfect all the time! 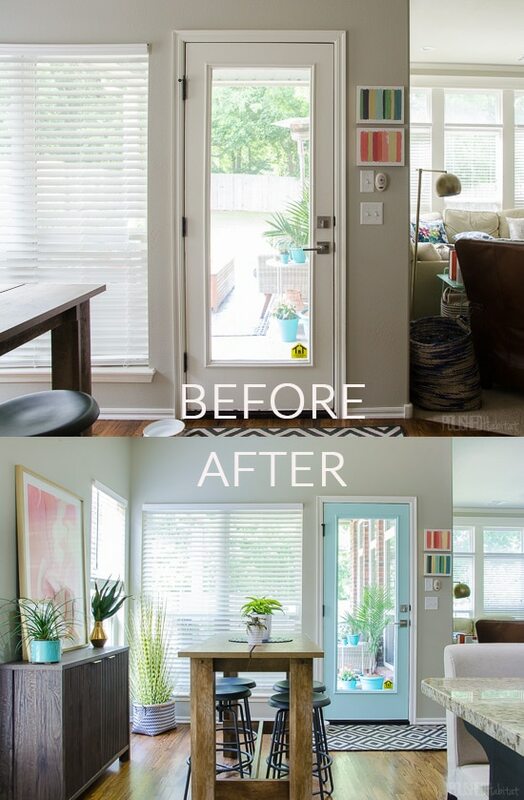 Oh my, what a delightful change that door has made!! Great Job! I love the new paint on the door. I was just wondering about your “G” wall. What have you that idea and how did you get it started? We needed something to fill the tall wall around the TV, and spent years with it blank because we couldn’t come up with anything we loved and could afford. I was brainstorming one day and came up with the idea to do different fonts. My husband is a graphic designer, so in addition to being visually fun, it’s a nod to that. Our last name is George and G’s have such a wide range of styles, so it was perfect! There’s an old post about it here, just forgive that it was my first year blogging so the photos are rougher and watermarked with my old blog name. 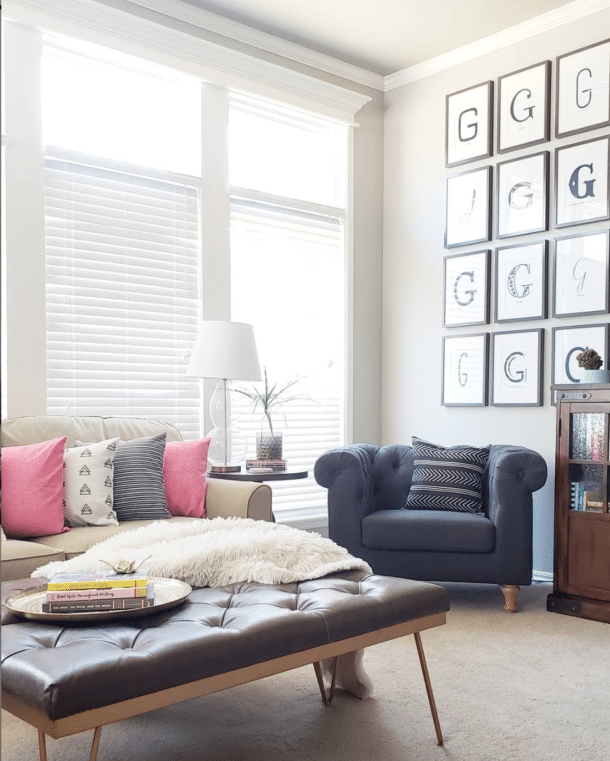 https://www.polishedhabitat.com/gallery-wall-typography-art/ . I love it! 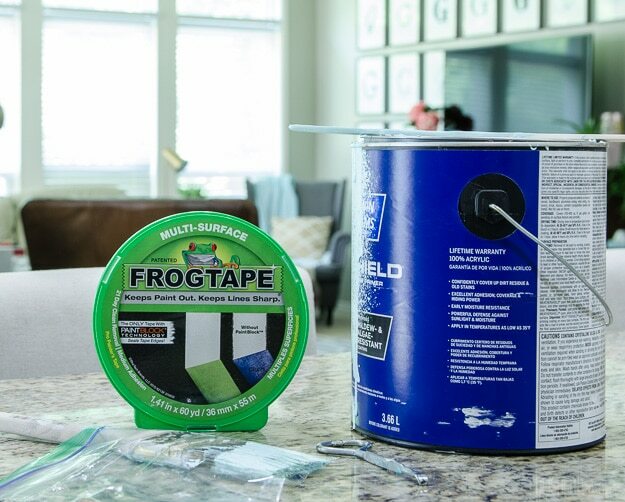 I use Frog Tape all the time too! May I ask what color of Sherwin Williams paint in aqua you used on your door? It’s perfect! Sure! It’s called Tame Teal (which throws me off since I’d call it Aqua too. 🙂 ). Thanks for visiting!